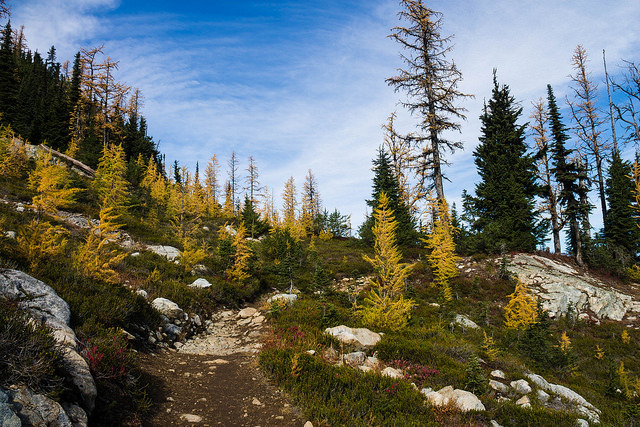 Alpine larches are the most magical of trees. They grow in conditions few other trees can, and are one of only two North America conifers to change color and annually shed their needles. We are extremely lucky to have just the right conditions for them to flourish on the eastern crest of the Cascades. For just a few weeks every year, these trees turn a vivid, unreal yellow, and if you time it right, you can catch them before their golden needles shed and disappear for another year. The Heather - Maple Pass trail is a truly stunning hike any time of year, but I think fall was the best time for a first trip. This trail had everything- dense, quiet mountain forest, sapphire lakes, open alpine meadows, and seemingly infinite layers of mountains. The larches didn't hurt either. I completely fell in love with the North Cascades on this hike and cannot wait to get back. I urge anyone who hasn't been to get up there ASAP!